Effective inbound marketing programs require many types of content and a lot of it. The purpose of that content is to move your buyer personas further along in their buyer’s journey. Different types of content are more effective in certain phases of the journey than others. This chart from HubSpot defines the most effective types of content for each phase of the buyer’s journey. An important type of content that is used in the consideration stage is the case study. Case studies are particularly important for small-mid size B2B companies. According to Demand Gen Report’s 2015 B2B Content Preferences Survey, the top 5 content formats that B2B buyers used in the last 12 months to research a purchase decision included: whitepapers, webinars, case studies, ebooks and videos. 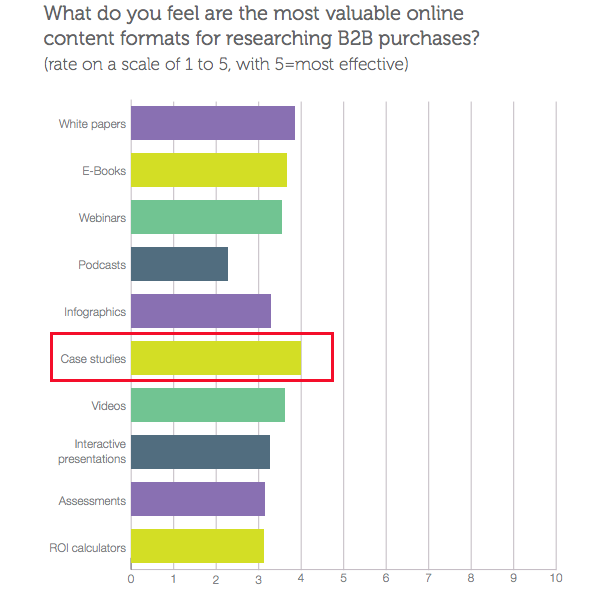 Additionally, when asked “What do you feel are the most valuable online content formats for researching B2B purchases?” respondents ranked case studies as the most effective. Effective case studies can make a big difference in how your prospects view your company and whether or not they continue with you into the decision phase. It is important that your case studies are well written and provide the information your personas are looking for. The first step in writing a great case study is to select the right stories. Your buyer personas will dictate what the right type of story is for them. Start by making a short list of customers whose stories will resonate with your buyer personas. Use your sales reps and account managers as a source of information. Try to include a few non-traditional customers as well as some from markets you have traditionally served. This probably goes without saying but it is important that the customers you select are delighted with your company’s products or services. Quotes from them about how your organization has solved a problem for them or made their lives easier go a long way with prospects. After you have identified the case studies you want to write, the next step is to contact those customers. The approach that I have found most successful is to contact them via email first. I always copy their account manager or lead technical person on the email message. I start each message with a positive note about their project or something I know they’ve recently completed. I then go on to explain the purpose of my message and provide a brief outline. I always include a summary of how much of their time I think will be required. Customers are busy. They do not always respond immediately. Working through your account manager, sales rep or technical lead may help get a quicker response. My experience has been that customers who are truly delighted with your products or services are very willing to participate in creating a case study. The purpose of case studies is to demonstrate to prospects how you have delivered a product or service that solved a problem for your customer. The format of your document should help you deliver that information. Start by defining the challenge. Every case study needs to define the challenge or problem your customer was facing. Explain how this issue was keeping them from reaching their goals or delivering results to their own customers. Include the obstacles they faced in trying to resolve the problem on their own. Your prospects will probably be able to relate to the challenges your customer faced. Move on to the solution. Describe how you worked with your customer to approach the problem. Explain the path you went down to identify the best solution. Clearly describe how your company’s solution alleviated the problem. Provide results. It is important to quantify the results of the solution your provided. It may be improved metrics or it could be something like hiring additional employees or opening a new office. The important thing here is to demonstrate how the solution you provided has improved your customer’s situation. Based on the format of your case study, you should be able to craft questions for your customer to answer that will help you write the story. Remember, your customers are busy so whether or not you are conducting the email in person or via phone or just by sending them a list of questions to answer, keep the number of questions low and the quality of each one high. Describe the problem or issue your company was facing before you began working with XYZ company. What obstacles and challenges were you facing? What other solutions did you try to alleviate the problem/challenge? What were the results? What led you to XYZ company? How did you decide our solution was right for you? Describe your experience working with XYZ company. What have been the most positive outcomes including specific measurable results? How has the relationship with XYZ company made things better/easier for you? Would you recommend working with XYZ company to others in your industry and beyond? The answers your customer provides may lead you to more questions. Make sure you understand their answers and represent their point of view accurately. Using the format you developed and your customer interview write the case study. Use language that resonates with your buyer personas. Write the case study like a story. Use a conversational tone. Pictures and other visuals should be included. When the case study is complete, make sure you send it to your customer to review and approve. And make sure you thank them for participating. Note: If required by your company or your customer, make sure a release form is completed. The first place to share your case study is internally. Make sure your sales reps are aware of it and explain how they can use it, where it is located, etc. Additionally, post the case study to your website like you would other types of content and promote it using social media. The research shows that case studies are an important content type for the B2B market. Make sure yours are moving your prospects along in their buyer’s journey.